Roger Federer takes on Robin Soderling, who knocked out tournament favorite Rafael Nadal in a fourth-round stunner, in the men’s final of the French Open on Sunday. A victory in Roland Garros would give Federer 14 Grand Slams, tying his career wins to American Pete Sampras. The second-seed Federer lagged at first, but beat Argentine Juan Martin del Potro on Friday to make the final. Soderling advanced over Chilean Fernando Gonzalez. 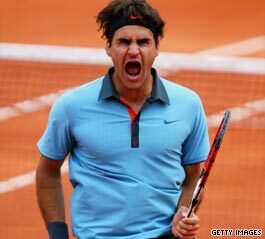 Federer, 27, has a 9-0 record over the 24-year-old Swede going into the final. The Swiss star has suffered emotional defeats recently. At England’s Wimbledon last year, he lost to Rafael Nadal after a five-year reign. The game, which ran about seven hours with a few rain breaks, was the longest-ever Wimbledon men’s final. Nadal also beat Federer in the Australian Open earlier this year. Soderling stunned the top-seed Nadal by handing him a loss in the fourth round of the French Open. The 23rd-seed Soderling was a rank outsider against the world number one who had never lost a match on the clay at Roland Garros and was a short-priced favorite to win a record fifth straight title. In women’s tennis, number one Dinara Safina was beaten Saturday in straight sets by fellow Russian Svetlana Kuznetsova in the final of the French Open at Roland Garros. Safina, who has reached the top of the world rankings despite not having a major title to her name, looked completely out-of-sorts against her compatriot, who secured a comfortable 6-4, 6-2 victory in just over an hour. The defeat was a crushing blow to Safina, 23, who has long had to contend with the accusations that she is not a worthy world number one — and this third grand slam final defeat will do nothing to silence the doubters. It was the second straight year she has lost in the final here, after going down in straight sets to Ana Ivanovic of Serbia last year. It was also her second successive grand slam final defeat, having lost to Serena Williams in the Australian Open in Melbourne earlier this year.